As the upcoming presidential election draws nearer, the role of the media in the digital age is more profound than ever. Historically, the media has always been deeply intertwined with politics from as far back as the first newspapers. Now, with modern technology, media and politics are more conjoined than ever. As the impact of social media and online news on politics expands, the role of the media is changing rapidly and now plays a larger role in politics than ever before. “No matter what politicians actually say, the media coverage rules what actually gets transmitted to the public,” said Martin Tipton ’17. With this growing responsibility of the media comes many difficult challenges. 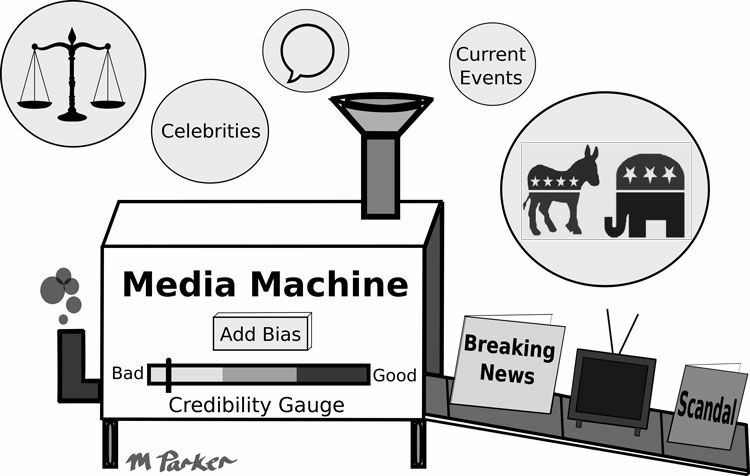 As an increasing amount of bias becomes present in media sources such as The New York Times, Fox News, CNN, and other news outlets, people are forced to choose what type of bias they would rather receive with their news. “The media by definition should be impartial, but that is almost never the case in modern-day politics. This leads people to choose certain media outlets that align with their views, which is not what media is supposed to be about,” commented Josh Ip ’18. This election, in particular, has brought out the separation between conservative and liberal media sources, thanks to the extremely radicalized and controversial candidates who have taken part, such as Donald Trump and Bernie Sanders. “The media has become polarized because people have such strong reactions to Trump. That puts the moderate Republicans in a difficult place because they do not want to vote for Trump or be associated with him, but by no means would they vote for Hillary,” commented Grace El-Fishawy ’18. The current media system faces the dilemma of producing substantial news while also trying to sell papers and make money. Many print papers are struggling to stay afloat in this digital age while new online sources attempt to gain credibility. Media outlets are turning to catchy headlines and viral videos rather than substantial political analysis and reporting. “The media is so focused on Trump’s off-color comments that Hillary’s actual political policy and plans are not being covered. It’s this type of instance where the media is just trying to sell headlines and Trump sells more than Hillary, so Trump is being reported more,” commented Tipton ’17. Throughout the course of the current election, students have observed the media’s approach to covering controversial candidates evolve to best suit the current political climate. “It seems like, in the beginning of the election, the media had a field day with the numerous absurd things Trump said. But I think when it became clear that he was a viable candidate, the media had a moment of self-awareness and there has recently been an increasing effort to ask him in interviews about his more outrageous statements and point out his inconsistencies,” observed the head of Hopkins’ Young Democrats, Toella Pliakas ’17. In the coming weeks, the media will continue to have a significant role in shaping the course of political coverage. “The media will definitely have a large influence as the election itself approaches. It will be interesting to see the influence of media coverage continue to evolve throughout the end of this election, as well as in years to come, “ reflected Maliya Ellis ’19.